The William K. Bowes, Jr. Award for Leadership recognizes EDF Climate Corps alumni who are leaders in their field and working to drive positive environmental change. EDF Climate Corps alumni are energy and sustainability leaders of today who are working around the world to tackle some of our most challenging environmental issues. This award is presented to alumni who have demonstrated exceptional leadership through actions such as developing scalable solutions, sharing best practices, collaborating across and within industries, and engaging in environmental advocacy. This award is dedicated to William K. “Bill” Bowes, Jr., an accomplished business leader and long-time supporter of EDF Climate Corps. A venture capitalist in the Bay Area for nearly 50 years, Bill devoted much of his time to education and medical research. After ten years, the EDF Climate Corps network includes over 800 alumni. We are proud to award these exceptional alumni with The William K. Bowes, Jr. Award for Leadership. 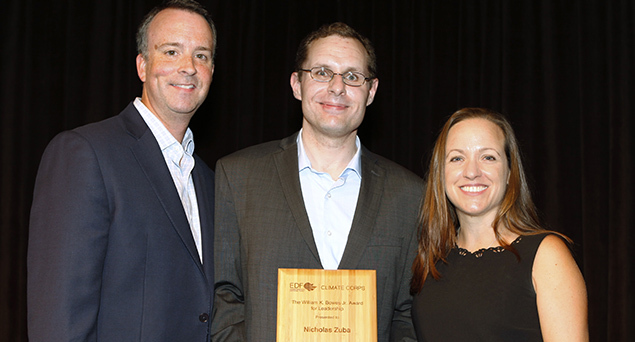 Nicholas Zuba has spent the last ten years driving policies and programs that combat climate change. In his current role managing the Connecticut Green Bank’s (CGB) Property-Assessed Clean Energy (PACE) program, he helps commercial and industrial property owners with paying for the upfront cost of energy saving improvements. Over the last four and a half years, the program has helped nearly 170 building owners get financing to make key improvements to reduce their energy costs. During his 2014 EDF Climate Corps fellowship at CA Technologies, Inc., he developed seven project recommendations that could save the company 3.7 million kilowatt hours of electricity, nearly 6,100 therms of natural gas, and almost 2,500 metric tons of carbon emissions. For this work, he was awarded EDF’s first annual Best Business Case award, given to the fellow who presents the strongest financial analysis for a project or recommendations with a positive net present value and high likelihood of implementation. Nicholas continues to share his skills and experience with the EDF Climate Corps program. He has served as an outside reviewer, mentored fellows in 2015, and in 2016, hosted fellows at the Connecticut Green Bank. His goal for the next five to ten years is to continue managing initiatives that help to remove energy efficiency market barriers for consumers, and has considering running for local or state office in order to promote pragmatic and sensible energy efficiency and environmental policy. Elizabeth Turnbull Henry is creating lasting environmental change through her leadership as the President of the Environmental League of Massachusetts. Before joining ELM, she served as the Director of Energy, Environment & ISO at adidas and proved herself as an environmental innovator whose work has served as an example for other corporations. Elizabeth was a 2010 fellow at adidas Group where she was hired on full-time after completing her MBA/MEM from Yale. Early in her post-graduate professional career, Elizabeth led the strategy development and launch for one of the first internal sustainability venture capital funds of its kind at a large corporation. Her work built on her experience in EDF Climate Corps and the opportunity to drive GHG emissions reductions while generating positive financial returns when viewed through a portfolio approach with blended environmental and financial objectives. Elizabeth’s work has been featured on the adidas Group blog and in GreenBiz, and her greenENERGY Fund’s results speak highly for themselves. Building on the success and momentum of her greenENERGY fund at adidas Group, Elizabeth has graciously shared her insights with others in the corporate sustainability community seeking to embed environmental considerations into financial decision making at their companies. She has spoken at numerous conferences, sharing as much passion and enthusiasm for this work as she shares strategic insights. Jenny McColloch has proven herself as a leader in corporate sustainability working to embed sustainability strategy into one of the world’s largest restaurant companies. From her 2011 fellowship at Nestle Waters North America to her current role as Director, Global Sustainability at McDonald’s, Jenny has worked toward leading collaborative change and is passionate about continuing to mainstream sustainable behaviors, investments and decision-making in business and communities worldwide. .
Jenny’s accomplishments at McDonald’s include helping to make McDonald’s USA the first national restaurant chain to share the Marine Stewardship Council ecolabel at all locations for Filet-O-Fish, helping to launch the first-ever globally-aligned, public sustainability framework and goals for the brand in 2014, and helping to coordinate McDonald’s engagement in the White House American Business Act on Climate Pledge in the lead-up to COP 21. Jenny is also dedicated to educating and inspiring others to care about the environment both inside and outside of work. She works with emerging leaders across industries serving as a resource, coach and mentor for young professionals trying to transition into the sustainability field. She is a big believer in building strong networks and helping others to unlock their own interests in social or environmental change – whether personally or professionally. She hosted EDF Climate Corps Fellow Ameer Azim at McDonald’s in 2014. Jaxon Love has demonstrated incredible leadership in and dedication to the EDF Climate Corps network, participating first as a fellow and going on to host eight fellowships at Shorenstein Properties, as well as mentoring many young professionals. In large part due to Jaxon’s mentorship, his fellows have gone on to energy and sustainability careers at companies like PG&E, Sun Edison, Lockheed Martin, and Booz Allen and work in fields including energy engineering, LEED consulting, and sustainability market research. Since joining Shorenstein Properties as a 2011 Climate Corps Fellow, and then as the Sustainability Manager, Jaxon has helped the office portfolio of 25 million square feet reduce energy use by 19.5% and carbon emissions by 19%, equivalent to an annual carbon dioxide emissions reduction of 26,000 metric tons. Jaxon also administers a LEED Operation and Maintenance program covering the entire portfolio, addressing water efficiency, green cleaning, waste management, integrated pest management, and indoor environmental quality. Jaxon Love has been dedicated to environmental change since his earliest days, conducting a carbon footprint of his high school for his senior science project and co-authoring a book on inter-generational environmental justice. As a Peace Corps Volunteer in Jordan, Jaxon organized environmental clean-up projects and has an MBA in Sustainable Business Practices from the University of Oregon. Jaxon strives to grow sustainable practices into the core of the real estate business model.